Jason joins the Menehunes and is the youngest player on the roster. He is a great teammate with a positive attitude to the game. He is learning every time he steps out on the court. Jason is an energizer to the team and plays great defense. He can hit down the open shot and is quick enough to score on the break. Look out for Jason for the up and coming leagues and tournaments. 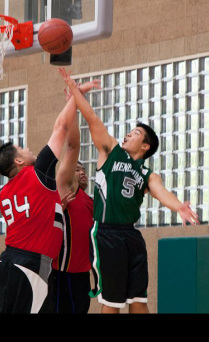 Game 2: Menehunes 57 defeat Tigerette Tsunami 37 and go 2-0 for the season. Lady-Menehunes go 2-0 for the season in a blowout over Tigerette Tsunami. Game 1: Menehunes 70 Defeat Usual Suspect 62 in season opener! 10/2/2011: The debut of the Lady Menehunes team. The Lady Menehunes start off there mark on a good note, opening the season off with a win! This is the first Win in Lady Menehunes History! Great job and lets get more W's! We are welcoming our Lady- 'Hunes!